Toledo. Throughout its history it has served as a capital for the Romans, the Visigoths, and eventually by Queen Isabella and King Ferdinand, who financed Columbus’s voyages to the new world. Sitting on a hill, the river Tagus bends around it on three sides, making it a military stronghold. The old city walls that once defended the city have mostly been torn down. It still visually shows what a great fortified stronghold it once was. The night before our day trip to Toledo, my husband told our children that in the morning, we were going to take a magic train back in time 600 years. Their eyes grew big and round with excitement. I love that they still believe in magic! And there is something so magical about Toledo, and how much it still resembles a medieval city. The train ride from Madrid is only half an hour from Atocha Station. The train station you arrive at is small, but beautiful. You walk through the train station and look up at the hill. There sits Toledo in all its beauty. A short 10 minute walk brings you through the gates and up into the walled city. 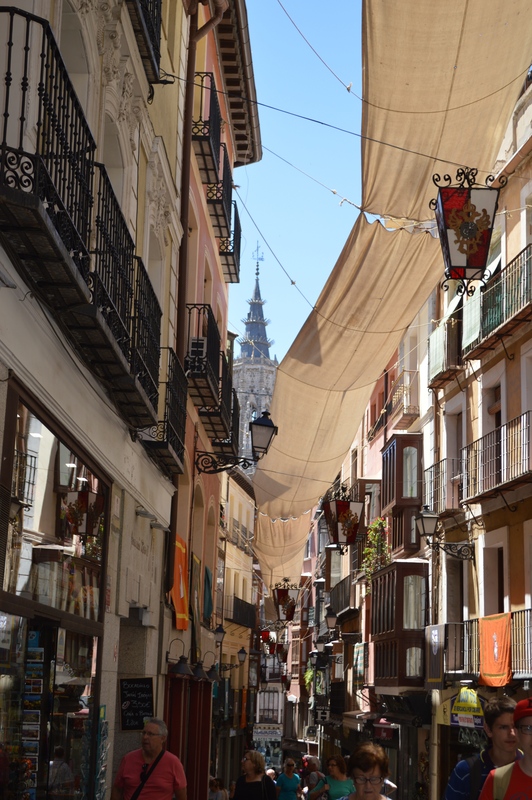 One thing I loved about Toledo were these long lengths of fabric hung over the streets that provided shade. 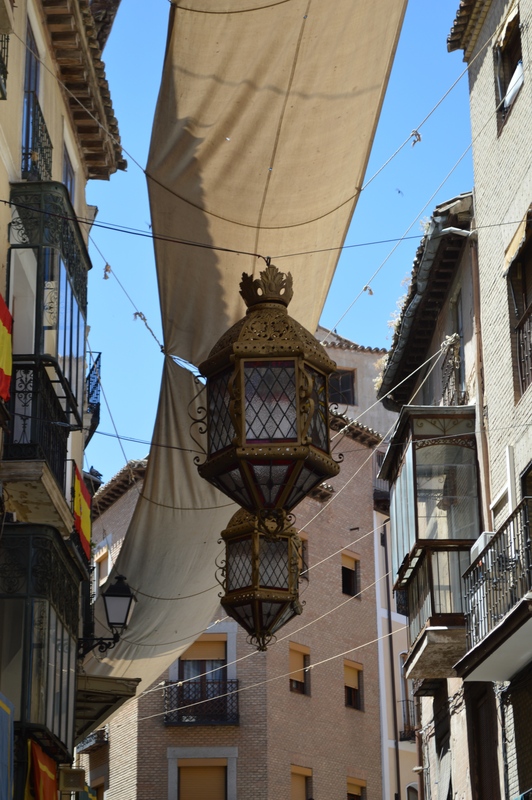 Each street had a different style of lantern that hung beneath the fabric. I could easily imagine a hot summer day in medieval times, fabric hung to shield the people moving through the city with their carts and horses. Beautiful wrought iron balconies adorn the buildings. 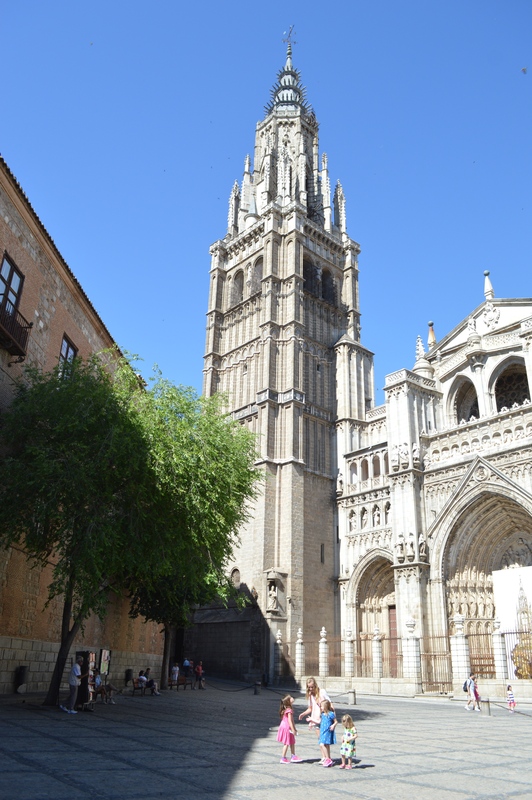 And then you turn down one street and see the spire of the cathedral of Toledo rising up in the distance. 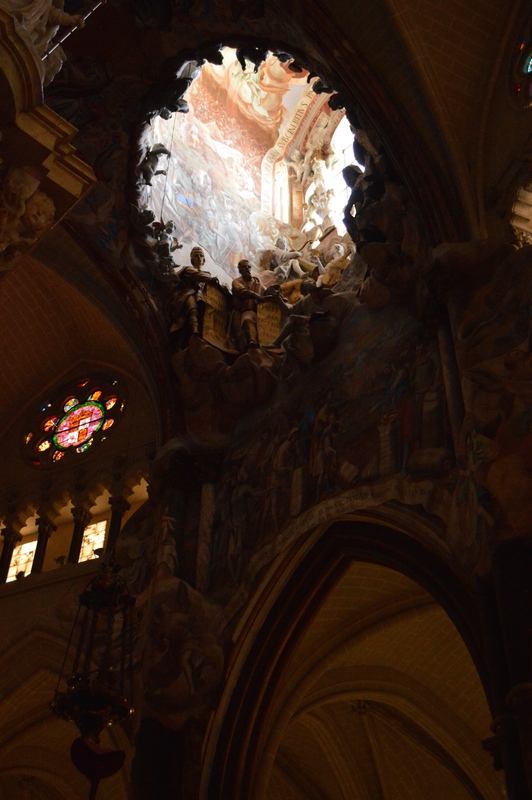 This cathedral is truly spectacular, and alone worth a visit to Toledo. On one side is the entry for those wishing to worship in the cathedral. The opposite side has an entrance for tourists, that also provides audio tours in several languages. It is worth the entry fee to see the interior of the cathedral. El Greco lived and worked in Toledo for many years. Some of his work is featured in the cathedral itself. 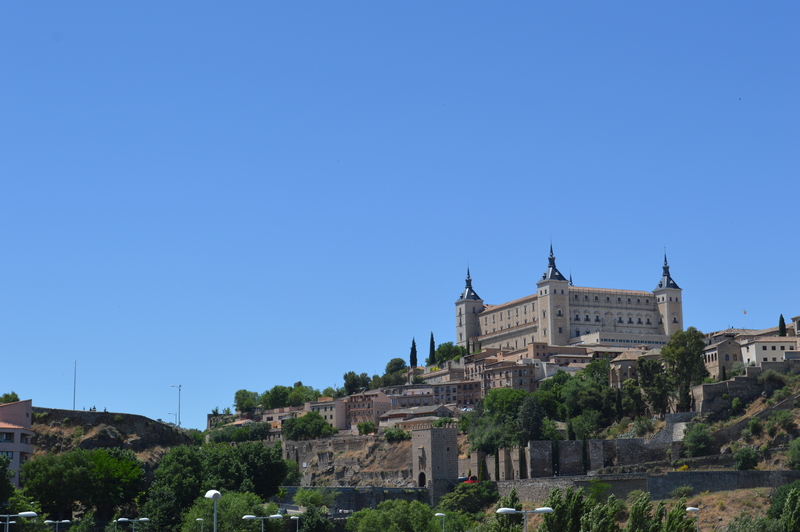 Of all the cathedrals we saw on our trip to Spain, Toledo’s is my favorite. Even our children walked through the cathedral with eyes open wide with wonder and delight. Our seven year old listened to much of the audio tour, and loved finding the things it was talking about. I loved seeing their faces studying and thinking about the art. Even our baby enjoyed crawling around the vast, cavernous space on the cool, smooth stone floor. I wonder what it really was like to be in Toledo 600 years ago? It is impossible to know for certain. A visit to Toledo is magical, whether or not you ride a magical train to get there.